Contact Tennessee Defective Product Lawyers The Law Offices of John Day, P.C. Last year, the United States Department of Justice (DOJ) obtained a $9.1 million dollar settlement from 3M based on allegations that 3M knowingly supplied defective combat ear plugs to our country’s servicemen and women. The earplugs at the center of the settlement are the dual-ended Combat Arms Earplugs, Version 2 (CAEv2). These defective earplugs were designed too short to properly insert into users’ ears thereby exposing them to loud noises. Below is more information on what this mean for service members at Ft. Campbell and the rest of the country. Why Are the Ear Plugs Defective? According to the settlement reached by the DOJ, since 2000, 3M and its predecessor Aearo Technologies, Inc. knew the earplugs they were supplying to the U.S. military were defective. The earplugs had failed to pass safety tests and violated the requirements of the military sales contract. The defect is related to the design of the earplugs . Specifically, they were designed too short for proper insertion into soldiers’ ears. As a result, the earplugs could loosen without the soldier being aware of it. The loosened ear plug allowed too much noise to penetrate into soldiers’ ears causing hearing loss, tinnitus and other issues. 3M, the company who manufactured the defective combat earplugs, had an exclusive contract with the U.S. military. As a result, from 2003 to 2015, they were standard issue for military members, so thousands of military men and women used the earplugs extensively. While any service member may have received injuries as a result of these defective earplugs, those most likely to have suffered hearing loss or other injuries are those working in loud environments or regularly using weaponry. In addition, civilian contractors who used the earplugs may also have claims. What Injuries Are Caused by the Defective Ear Plugs? Military personnel who used the earplugs may have developed hearing loss or tinnitus, which can lead to other conditions such as dizziness, depression, anxiety, etc. Both are explained more fully below. Hearing loss is easily measured by an audiologist using an audiogram. The audiogram will show what level of hearing you have compared with those with normal hearing. Symptoms of hearing loss include difficulty understanding words especially in noisy environments, avoidance of conversations and social settings, difficulty hearing consonants, frequently asking people to repeat themselves or to speak louder, needing the TV or radio to be at a volume others find too loud. 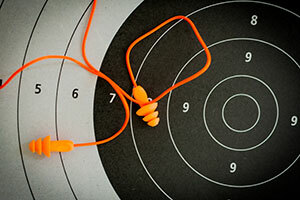 Most hearing loss is not curable but it can be improved with hearing aids. Hearing loss can significantly affect a person’s quality of life and has been linked to depression and anxiety. Tinnitus is a constant ringing, buzzing, hissing or clicking in the ears. Tinnitus can cause dizziness, trouble sleeping, difficulty concentrating, memory problems, depression, irritability and anxiety. Tinnitus can cause phantom noise in one or both ears, and it may be constant or come and go. In some patients, the tinnitus is so loud it prevents them from hearing other, real sounds which can expose them to danger. How Do I Know If I Was Exposed to Noise Loud Enough to Cause An Injury? A hand grenade is 158dB. Unprotected ears exposed to short term noises of 140 dB can suffer a stretching of the delicate inner ear tissue, which causes injury to the sterocilia and the sensory cells. Or, military members can suffer hearing loss from long-term exposure to less-loud sounds (but still loud enough that you need ear protection) from either cell death through one of two processes: apoptosis or necrosis. What Should I Do If I Believe I Have a Case? If you or someone you love is suffering hearing loss or tinnitus or other ear-related injuries after using the 3M dual-ended Combat Arms Ear Plugs, Version 2 (CAEv2), you may be entitled to compensation for medical bills, pain and suffering, loss of enjoyment of life, etc. This is true even if you have already received hearing aids or other treatment from the VA or you have received disability payments. At the Law Offices of John Day, we offer free-consultations for all defective earplug cases. If we think we can help and you decide to hire us, our award-winning lawyers will handle your case on a contingency basis, which means we only get paid if we win. If you live in Hopkinsville, KY or Clarksville, TN, we have an office conveniently located in downtown Nashville. If you are stationed at Arnold Air Force Base in Tullahoma, we have an office close to you in Murfreesboro, TN. If you are elsewhere in the State or if your schedule does not permit you to come to us, we are happy to come to you. We are here to help our country’s military members receive the compensation they deserve as a result of 3M’s defective earplugs. To get started, give us a call at 615-669-3993 (Nashville) or 615-867-9900 (Murfreesboro) or 866-812-8787 (toll-free) for a free consultation.